Peppers are a common addition to most vegetable gardens. This unique food is considered a fruit and a vegetable and is full of flavor. You don't need to be afraid to add some pepper plants to your garden and this section has some tips that will make the process easier. If you have never planted peppers, you might become overwhelmed by how many different types there are to choose from. There is a great article here that will help calm your anxieties. You'll also find some tips that will help you plant and care for your peppers so that what you produce will taste great. The following articles are available for the 'Peppers' topic. Click the article''s title (shown in bold) to see the associated article. Green peppers are a great treat that are very popular in the United States. If you want to grow your own, start by growing them indoors the last few weeks of winter. Transplant them outside once temperatures are warm. Make sure moisture to the plant is uniform. Cut the peppers off the plant when ripe, waiting longer if you want different color peppers. 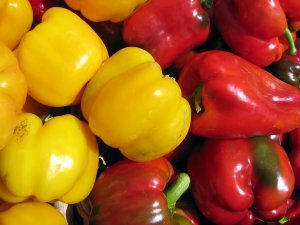 Bell peppers, banana peppers, and spicy peppers are all favorites of home gardeners. Many new gardeners think that peppers are particularly easy to grow, and cultivate. Unfortunately, this isn't exactly the case. Proper pepper care can give anyone fits, unless they take some time to learn a few guidelines. Peppers are a great item, but a little difficult to understand. So many peppers exist, but can generally be categorized into mild and hot. Growing them is fairly easy, and you can use them for a variety of reasons. Experiment with what you like, and consider using pepper for decoration as well as for food.